Photo-engraved brass tread and corner steps; a drop-in fit for Athearn GP38-2 and GP40-2. Proto 2000 SD60. Photo-etched on ultra-thin brass, parts feature exact scale hole layout on corner steps. Three Step Version of Athearn Genesis SD70-75. Photo-etched on ultra-thin brass, parts feature exact scale hole layout on corner steps. Proto 2000 GP60. Photo-etched on ultra-thin brass, parts feature exact scale hole layout on corner steps. Athearn SD50, SD60, and SD60M. Photo-etched on ultra-thin brass, parts feature exact scale hole layout on corner steps. Proto 2000 SD45. 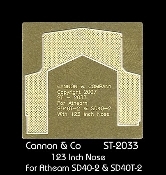 Photo-etched on ultra-thin brass, parts feature exact scale hole layout on corner steps. Athearn Genesis SD70MAC. 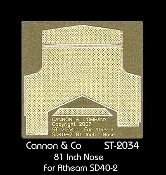 Photo-etched on ultra-thin brass, parts feature exact scale hole layout on corner steps. Proto 2000 SD50. Photo-etched on ultra-thin brass, parts feature exact scale hole layout on corner steps. Photo Etched Safety Tread Stock 1.42 x 5.7" Sheet These sheets have been etched fron copper to prevent curling during the etch process. Photo Etched Safety Tread Strips. 5 Strips .245 x 5.46" These sheets have been etched fron copper to prevent curling during the etch process. Proto 2000 GP7, GP9, GP18 and GP20. Photo-etched on ultra-thin brass, parts feature exact scale hole layout on corner steps. Athearn SD45T-2. Photo-etched on ultra-thin brass, parts feature exact scale hole layout on corner steps. Athearn SD45-2. Photo-etched on ultra-thin brass, parts feature exact scale hole layout on corner steps. Athearn MP15AC. Photo-etched on ultra-thin brass, parts feature exact scale hole layout on corner steps. Proto 2000 GP30. Photo-etched on ultra-thin brass, parts feature exact scale hole layout on corner steps. 2027 EMD Cast Front "F" Plates. Athearn Genesis F45/FP45. Photo-etched on ultra-thin brass, parts feature exact scale hole layout on corner steps. Athearn SD40T-2. Photo-etched on ultra-thin brass, parts feature exact scale hole layout on corner steps. Athearn SD40-2. 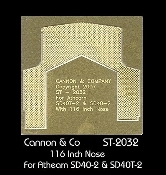 Photo-etched on ultra-thin brass, parts feature exact scale hole layout on corner steps.